I bought more than one-kilo of chicken wings the other day to grant my kids’ wish to prepare chicken lollilop for them. I followed the simple steps I wrote in my quick menu plan. The steps are easy you can prepare this in no time at all. I marinade the chicken with lemon juice, garlic, salt and pepper and let it stand for a few minutes before dipping in flour. I wasn’t able to find Parmesan cheese so I strike out the cheese and egg in the ingredients list. I fry the lollipops on medium heat until golden brown. Since my kids’ love the way I prepare this easy chicken recipe, I’m thinking of cooking the same for their Christmas party or give some to the teachers. But if the budget won’t allow my plan, I guess a photo frame gift for her will do for teachers and exchange gift for classmates. 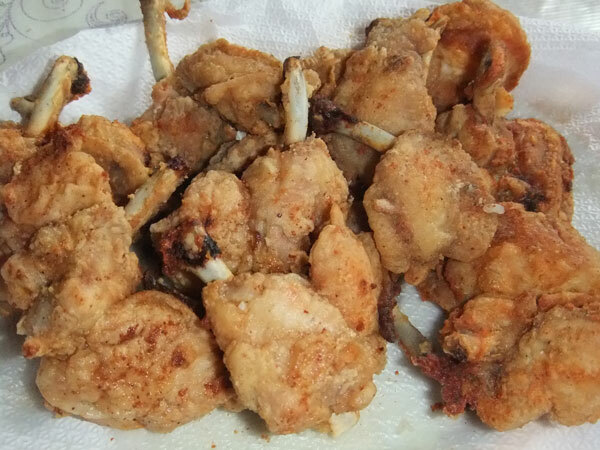 This entry was posted in All Year Round Food, Favorite Food and tagged chicken lollilop recipe, chicken lollipop on September 17, 2011 by Yami. my sis loves chicken. she can eat it everyday w/o complaining!